An eyewitness, Shahid Khan, told the BBC that because of its location on a steep ridge the statue had been only slightly damaged. It is carved into a 40m (130-foot) high rock. 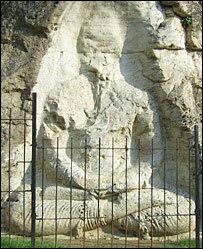 Local archaeology expert Professor Pervaiz Shaheen told the BBC that the Buddha statue in Swat valley was considered the largest in Asia, after the two Bamiyan Buddhas. He said it was 2,200 years old. Swat valley is a centre of the ancient Gandhara civilization. "They constructed similar smaller statues and figurines, dozens of which are still present in the area," Prof Shaheen said. Swat has seen increased pro-Taleban activity in recent months, with the re-emergence of militant group Tehrik-e-Nifaz-e-Shariat-e-Mohammadi (TNSM) under new leader, Maulana Fazlullah. Last week, militants blew up about 60 music, video and cosmetics stalls at a market in the valley after stall owners ignored warnings to close businesses deemed un-Islamic. The world watched in shock in March 2001 as Afghanistan's then rulers destroyed the 6th-Century Bamiyan Buddhas. The Taleban said they were offensive to Islam.